HI-Larious. 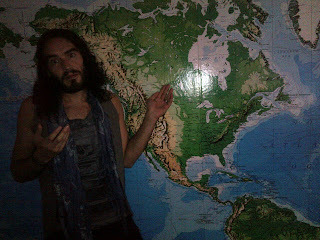 Russell Brand has a bunch of upcoming shows in Canada including one in Calgary that I have tickets to. So on Saturday when I saw him tweet that he was unable to go to a show in Ontario because Canadian customs would not let him through I got a little worried. (Ok, let's be real....I lost my mind). But it turns out that his plane had a mechanical problem and he never even got in the air. Don't worry Canadians...Mr. Katy Perry is still able to come to the great white north. HELP! I'm gonna be late for Casino Rama show unless someone can force Canadian customs officials to let us land in Orillia! Let me in! I must perform at Casino Rama, Orillia tonight at 9 for 5000 Canadians! Tonight's Casino Rama show postponed. I'm sorry. I can't enter Canada. We must abolish the borders between our nations AND our minds. Well done Russell, well done.